The northern sea nettle is not a jellyfish to be trifled with. Its long tentacles contain millions of venom-packed stinging cells ready to inject powerfully painful toxins. Which is why Nobuhiko Sato, a Ph.D. student at the National Institute of Polar Research in Tokyo, Japan, was so surprised to see a diving species of seabird, the thick-billed murre, getting up close to these dangerous gelatinous giants. Sato was studying how the birds feed, looking to connect diving behaviours with different food-related activities. By fitting the animals with data loggers that captured both video and changes in acceleration, he hoped to link different movements to actions related to hunting the small fish and invertebrates that make up the birds’ diet. But when he downloaded the videos, he was shocked to see the avian divers actively swimming towards the large, menacing jellies. 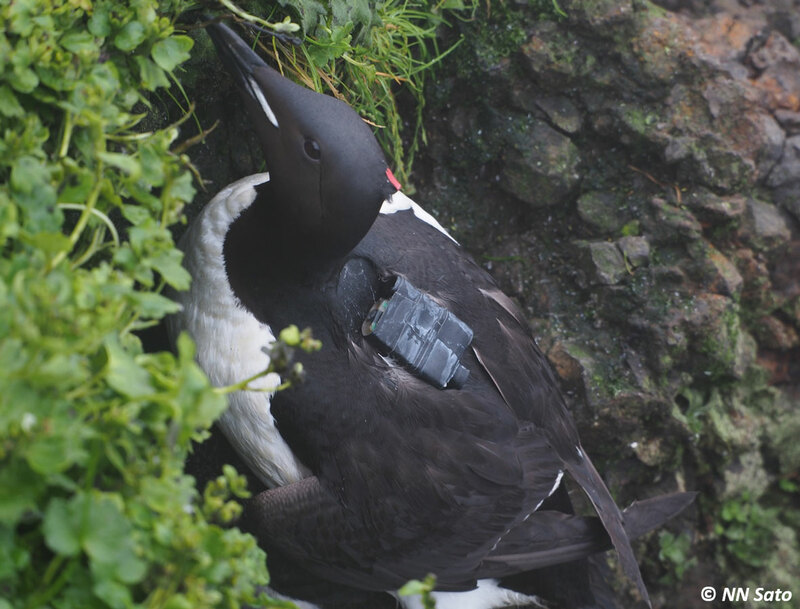 A thick-billed murre (Uria lomvia) with attached data logger. “When I checked video footage from bird-borne video loggers at the field station, I was surprised that the birds encountered so many jellyfish underwater,” he recalls. Then he saw four of the birds actually eat fish swimming around the jellies. “I was so excited!” he says. Intrigued, he designed a study to further examine the behaviour, the results of which were just published in the journal Biology Letters. 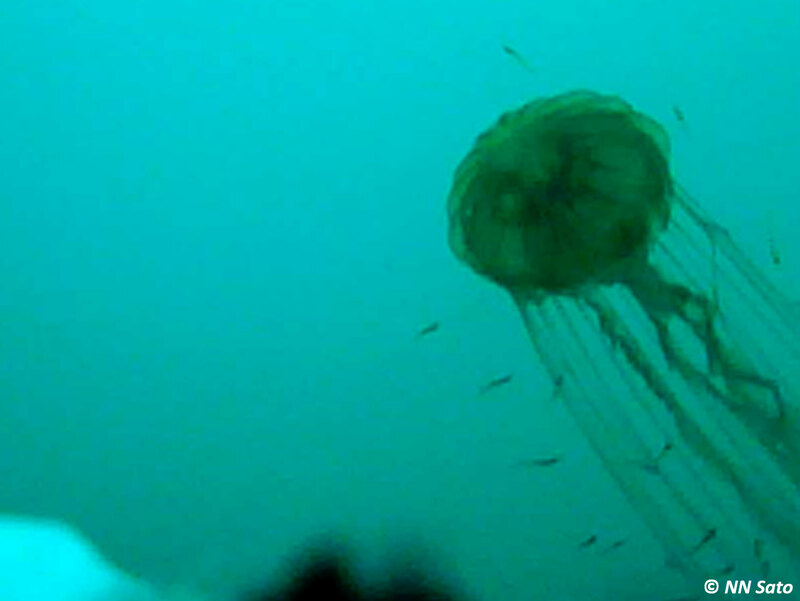 Scientists have observed small fish hiding amongst the tentacles of large jellies like the northern sea nettle (Chrysaora melanaster) for decades. It’s believed that the dangerous tendrils deter potential predators, so young fish gather in and around the jellies for protection. The diving birds, it seems, have learned that these large jellyfish, especially aggregations of them, mean lots of fishy food. In Sato’s study, the murres (Uria lomvia) encountered jellies on 85 percent of their dives, with some individuals seeing them during every single plunge – a strong indicator that the birds were choosing where to hunt because of the jellies. A large jelly (Chrysaora melanaster) with fish among its tentacles, as seen from a bird's eye view underwater just prior to feeding. “We observed that all four focal individuals approached jellyfish and fed on fish swimming around their tentacles,” explain the authors in their results. Almost one in five of the fish consumed were jelly-associated, and the more fish swimming around in the tentacles of a particular jelly, the more likely it was that the bird would swim over and feed from the school. While this study focused on murres, Sato believes other seabirds may also have figured out that jellyfish = food. These large jellies have become more and more common in recent years, with big blooms a bane for fishermen in the Bering Sea. Some have expressed concern that the spread of these jellies will negatively impact other species, including other predators. However, the thick-billed murres likely benefit from the jellies’ presence. “These observations suggest that the impacts of jellyfish blooms on marine ecosystems are more complex than previously anticipated and might be beneficial,” the authors write. As for the danger factor, the birds also appear to be aware that the tentacles themselves are not to be touched. “When birds fed on fish associated with jellies, they picked up fish from the edge of associations, not the center,” Sato notes. As part of this research, Sato was unable to determine exactly how much of the birds’ energy was obtained from jelly-associated fish due to technical limitations with the loggers. He hopes to tackle this question in a follow-up study this summer.